LATISSE EYELASH SERUM | EYELASH CONDITIONER AND EYEBROWS – 10 CONSUMER PRODUCT TEST. Latisse is recommended for women who would like to have longer, thicker, and stronger eyelashes. The product is favourable mainly because of its fast manner of working. The truth is, Latisse might be perceived as a fairly specific eyelash serum. The manner of Lattise application differs from the way other similar products are put on. The only element that remains the same is the necessity of removing make-up before distributing Lattise on eyelids. In order to perform the application, a brush with flat tip is required. One drop of the eyelash serum has to be squeezed onto the applicator. Next, the product has to be distributed along eyelash line of upper eyelid. When this is done successfully, you have to take another applicator in order to perform the application on the second upper eyelid. The truth is, there is no need in applying Lattise on lower eyelash base since the product will find its way to reach it. For that very reason, the eyelash serum has to be put on at bedtime. The first effects are obtained after around four weeks since the first application. During the remaining part of the treatment, eyelashes get longer and denser. When coated with a mascara, eyelashes look fuller, bigger, prettier, and slightly curled. Unfortunately, the outcomes do not hold long – these tend to disappear after two months since the last application performed. Another drawback to mention, not everyone is destined to benefit from Latisse. This concerns all pregnant and breastfeeding women as well as those who have suffered from severe diseases. Basically, underage are not recommended to use Latisse as well. When it comes to people who have sensitive either eye skin area or eyes, those who are under dermatological or opticians care or those who are allergic to some substances should consult a doctor and discuss the willingness of undergoing Latisse treatment. The truth is, the eyelash serum might cause irritations like, for example, eye pain, broken capillaries on eyelids and redness of eyeballs. 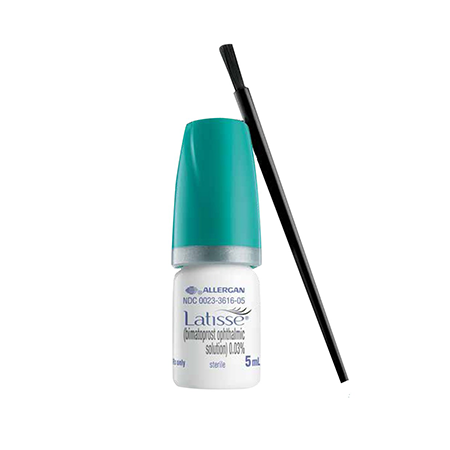 Latisse is closed in a little bottle that stores 3 millilitres of the eyelash serum. Such an amount holds out for approximately four months of treatment. Moreover, the dosage of the cosmetic is extremely easy since the bottle is designed in such a way to distribute only one drop of the product, which is the optimal amount that is used for a single application.